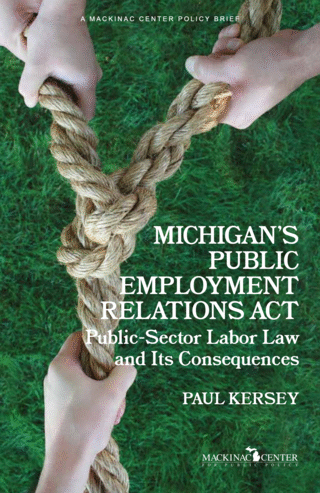 The Michigan Public Employment Relations Act, which governs collective bargaining between local governments and their employees, is simultaneously among the most important and least-discussed laws ever passed by the Michigan Legislature. Because the work of public employees is the work of government, PERA affects nearly every aspect of local government operations. The incentives created by PERA tend to push local officials toward tax increases rather than spending cuts. Unless local officials are prepared for a bargaining impasse, unions have an effective veto over any part of a local government’s budget dedicated to personnel costs. Personnel costs can make up as much as 80 percent of a local government’s budget. Work rules found in collective bargaining agreements add to the scope of the “union veto.” In practice, government union negotiators can manipulate any political issue that can be expressed in terms of employee compensation, job duties or work standards and be included in a collective bargaining agreement. Court rulings have consistently held that collective bargaining trumps local statutes and even local charters. PERA has arguably subverted the home-rule principles expressed in the state constitution. With agency fees effectively granting millions of dollars in guaranteed revenue to unions with strong political tendencies and little financial accountability, it would be fair to say that PERA has created a permanent, taxpayer-funded lobby for big government. The government employee unions created by PERA may be the single largest obstacle to restoring the state’s prosperity. Collective bargaining for government employees is not an inalienable right, and its practice in Michigan has added billions of dollars to the cost of government. The repeal or restructuring of PERA could resolve the state’s chronic fiscal crisis. PERA is long overdue for a thorough re-examination, leading to the rewriting or repeal of the law.